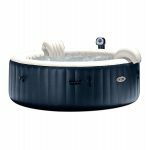 Tag Archives for " inflatable "
The Intex Pure Spa 6-Person Inflatable Portable Hot Tub is a wonderful addition to any home if you are fond of hot tubs. This inflatable hot tub has ample space for six adults and you can easily inflate it in your garden or patio with a spa pump. Along with being easy to operate, the hot tub comes with a range of health benefits all of which are associated with soaking in hot water. Cheap inflatable hot tubs are simply great. These tubs are easy to use and you can set them up in no time at all. What’s more, you don’t even need to use any special equipment to get them set up and started, simply attach the hot tub to a spa pump and fill it up with air. Once the tub is inflated, fill it with water and plug it into the power outlet. Most inflatable hot tubs use 110v power outlets and there is no need to get additional electrical fittings either. Another advantage of inflatable hot tubs is that these are easy to move around. Once you deflate the tub, you can place it where you like and inflate it once again. The tub can be quickly filled up with water and heated. As these tubs are made from highly durable and heat retentive material the water stays hotter in these tubs for a longer period of time.